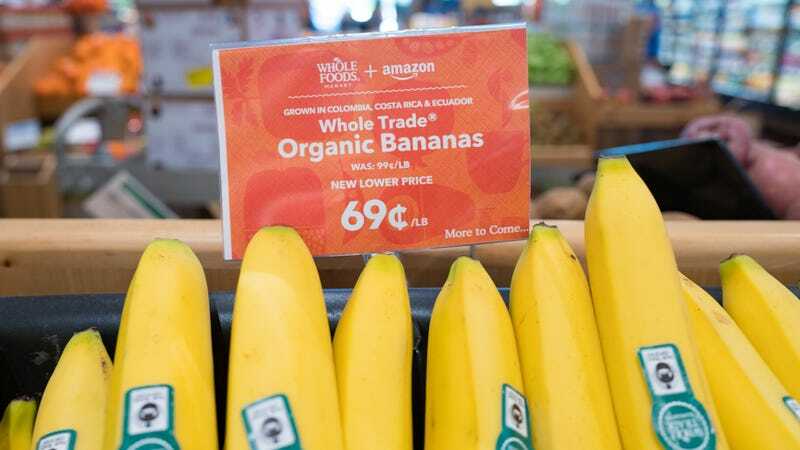 Amazon also recently took over the Whole Foods chain. (Photo via Smith Collection/Gado/Getty Images). Over the past few months, we’ve seen the advent of robot waiters and driverless delivery cars. Today, Amazon Go opens its long-awaited store in Seattle, which lacks checkers and grocery-baggers. People just pull things off the shelves, put them in a bag, and head out the door. An online receipt shows up soon afterward. It’s like shoplifting with a bill. Amazon accomplishes this with an elaborate overhead camera system, which records your every move and every item you put in your orange Amazon bag (no carts!) Many outlets are writing about the Amazon Go store today—with Bloomberg noting that the outlet favors gourmet items like Mediterranean lamb over chili cheese dogs, negating any sentiment that this store is a Safeway-type enterprise. Near as we can tell, only The New York Times has attempted to actually steal from the store; with Amazon’s prior approval, writer Nick Wingfield wrapped a six pack of Vanilla Coke in a grocery bag and tucked it under his arm. He still got billed for it. The enterprise also continues Amazon’s recent acquisition of Whole Foods, pushing the synergy of those two brands. The store isn’t totally staff-less. Bloomberg reports, “The 1,800-square-foot store is in the ground floor of Amazon’s new Seattle headquarters complex. On a recent lunchtime tour, about 10 chefs were in a kitchen making salads and sandwiches, and several other employees replenished the shelves.” There are also staff to help steer patrons to the correct departments, and check IDs in the liquor department. Still, we know where this is all going. What happens when our future AI overlords decide they don’t want to feed us anymore? We can just picture starving future us pounding fruitlessly on the unbreakable plastic door of some 2032 grocery store, with “We’re sorry, we can’t do that” on an endless loop over the loudspeaker.